PECK CIVIL performed initial feasibility studies to identify the potential configuration of the house while the project was under different ownership and design architect. Prior to the current phase, landslide debris was removed and a failing site wall 20 feet high was replaced under the direction of PECK CIVIL and PECK STRUCTURAL. After SAOTA was selected , PECK ARCHITECTURE and PECK CIVIL remained central to the project, and has held the primary responsibility with respect to design documentation, design detailing, permitting, and construction administration. The project is currently under construction. 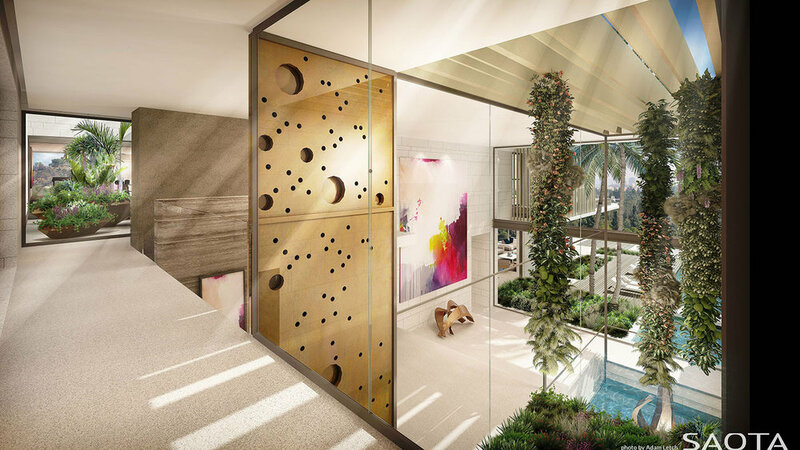 The project involves extensive site features including an elevated motor court and driveway, several water features, and a large motor court, two connected infinity swimming pools, a spa and a pool bar.